Copyright й 1992 American Geophysical Union. Gondwana, with East Antarctica as its center, began to fragment during Late Triassic to Early Jurassic time. 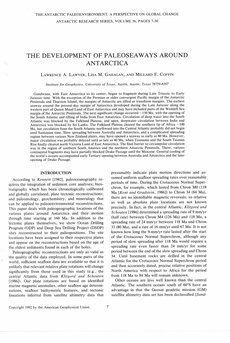 With the exception of the Permian or older convergent Pacific margin of the Antarctic Peninsula and Thurston Island, the margins of Antarctic are rifted or transform margins. The earliest seaway around the present-day margin of Antarctica developed during the Late Jurassic along the western part of Queen Maud Land of East Antarctica and may have included parts of the Weddell Sea margin of the Antarctic Peninsula. The next significant change occurred бн130 Ma, with the opening of the South Atlantic and rifting of India from East Antarctica. Circulation of deep water into the South Atlantic was blocked by the Falkland Plateau, and open, deep water circulation between India and Antarctica was blocked by Sri Lanka. The Falkland Plateau cleared the southern tip of Africa бн100 Ma, but circulation from the South Atlantic northward into the Central Atlantic probably did not begin until Santonian time. Slow spreading between Australia and Antarctica, and a complicated spreading regime between various New Zealand plates, may have opened a seaway as early as 80 Ma. However, major circulation was probably delayed until as late as 40 Ma, when Tasmania and the South Tasman Rise finally cleared north Victoria Land of East Antarctica. The final barrier to circumpolar circulation was in the region of southern South America and the northern Antarctic Peninsula. There, various continental fragments may have partially blocked Drake Passage until the Miocene. General cooling of the world's oceans accompanied early Tertiary opening between Australia and Antarctica and the later opening of Drake Passage.